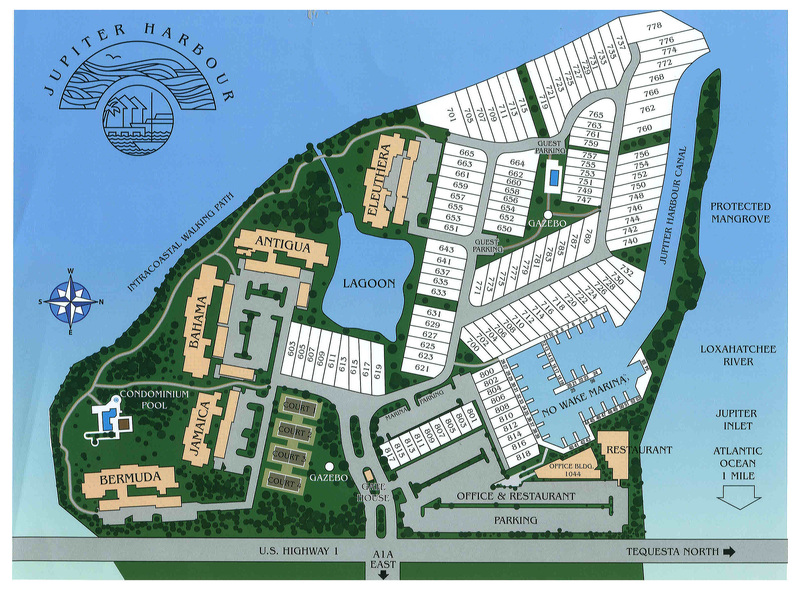 Jupiter Harbour is a manned gate Intracoastal community which sits on the Intracoastal waterway in Jupiter overlooking the Jupiter Lighthouse. They have a private marina and have townhomes, condos and several single family homes directly on the Intracoastal.The condos are 2 and 3 bedroom units ranging from 1,440 to 2,060 sq. ft. overlooking the Intracoastal waterway with a small park like setting in which you can stroll along the Intracoastal.The community pool sits out back overlooking the Intracoastal Waterway. The condos have one covered parking space and pets are not allowed. Many times you will be see owners sitting down on the banks of the Intracoastal reading and watching the boats. Many owners will launch their kayaks from the shores there as well and paddle along the Jupiter waterfront homes. Browse listings for available Jupiter condos, or Read more & see aerials of Jupiter Harbour condos in Jupiter. The Jupiter Harbour townhomes are 2 and 3 bedroom units with one or two car garages with several overlooking the marina or Intracoastal. The older townhomes were built in the 80's and are frame construction. They range from 1,800 to 2,200 sq. ft. They are two or three story townhomes and of several different designs. Just across the way you will find Jupiter Cove condos which also sit on the Jupiter Inlet and Jupiter Inlet Colony homes are nearby. The newest Dockside townhomes were built in 2005 and are either 1,700 sq. ft or 3,000 sq. ft. The newer townhomes have hurricane windows and all the features of newer condos that you would expect such as taller ceilings and open floor plans. The larger townhomes overlook the marina. The Jupiter Lighthouse can be seen in the distance. The single family homes sit directly on the Intracoastal with their own private docks. The community is gated with community pool and tennis. The marina has slips to buy or rent for boats to about 40 ft and is well protected and just minutes to the inlet. Boaters look at Jupiter Harbour. As part of the Jupiter Riverwalk the community sits between Harbourside Place and the Funky Fishing Village. A new Jupiter waterfront restaurant is being built by Michael Jordan on the property overlooking the Jupiter Harbour marina. The new Harbourside Place is located at the corner of US 1 and Indiantown Rd overlooking the Intracoastal Waterway. Living here will give you walking access via the walkway that ties all of Riverwalk together. On the other side of the Jupiter bridge is a new Fresh Market as well as a couple other favorite Jupiter restaurants. You will be right in the middle of the action here in Jupiter. If you want to see other Jupiter beach condos feel free to ask us for more information. Come look at more Jupiter homes for sale here online. We also sell and service other areas including Boca Raton oceanfront condos or Singer Island oceanfront condos. If a Jupiter Harbour Condo listing has caught your eye or you want more information about Jupiter, FL real estate, please don't hesitate to call 1-561-744-7025, or email via our handy contact form with any questions or to arrange a showing.